Content Marketing: everyone is doing it. According to Demand Gen Report, 47% of buyers viewed between 3-5 articles of content before engaging with a sales representative. The same report found that 96% of B2B buyers want content rich with information from industry influencers. A 2015 Content Marketing Institute study found that on average, B2B marketers allocate 28% of their total marketing budget to content marketing. HubSpot discovered that 53% of marketers report creating blog content as their number one inbound marketing priority. To be an effective B2B online marketer in these times is synonymous with being a content marketer. And while the statistics about the effectiveness of content generation are humbling, they do little by way of helping you create an effective B2B content marketing strategy for your business. The first step of a successful content marketing strategy for B2B businesses, much like the first step of marketing in general, is to fully understand the target audience. 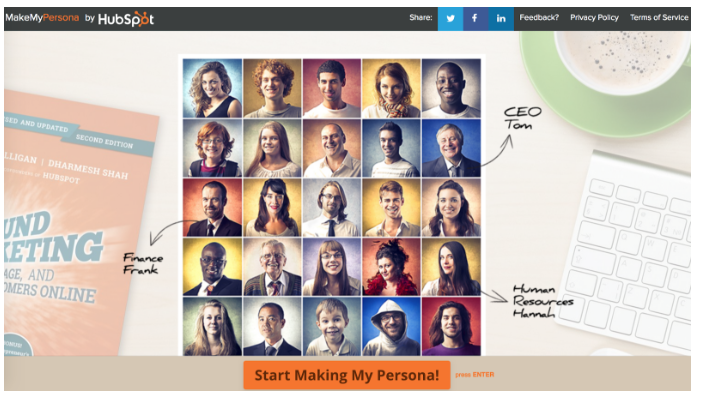 Build buyer personas so you can then segment your audience and create content that resonates with each persona. One important factor to consider is the business pain experienced by each persona and the way your solution solves their pain. Strategically, starting with this fundamental building block is very important. If you do not know who it is you are targeting, you have little chance of creating content that guides them to act. The tool will take you through a series of questions which will help you in developing a detailed overview of who exactly your buyer personas are. Once you understand each of your B2B buyer personas and their pains, you need to map out their buying cycle. Each stage—Awareness, Consideration, and Decision—brings with them their own set of unique circumstances and therefore require different types of content. While one persona may spend a lot of time (and therefore, need a lot of supporting content) in the Awareness stage of the buying cycle, other personas may need more resources in the Consideration stage. While you are mapping out the buying cycle stages per persona, pay special attention to the roadblocks that are barring the user from progressing to the next stage. By proactively addressing these issues within your content, you can help users along the cycle. Lack of a seamless customer experience. This can lead to prospects feeling a disconnect between how they’re treated via different channels. All channels and teams should be unified in the way they interact with the customers. Asking for too much too soon—meaning you’re not factoring in what stage a lead is in the buyer’s journey. 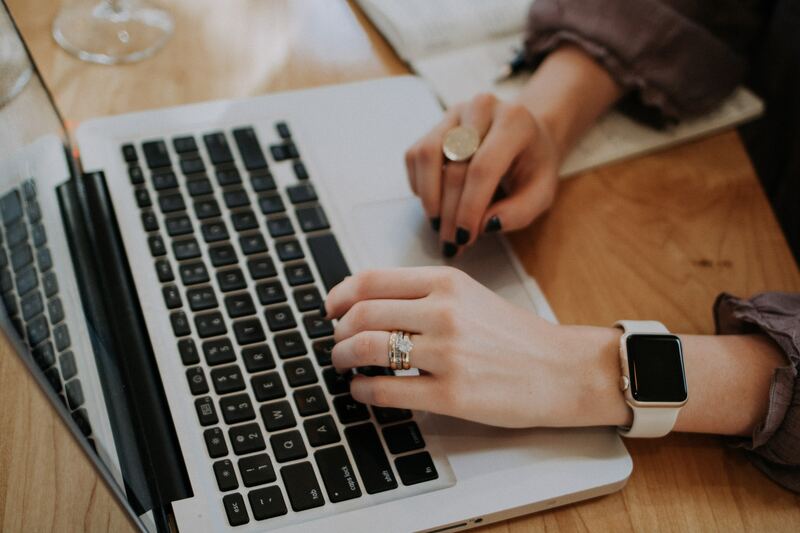 When creating content or contact forms you must take into account the lead’s level of engagement depending on what stage of the buyer’s journey they are currently in, or risk them feeling overwhelmed by your content. Not personalizing content to fit your persona’s needs. Even the slightest hint at an email or content item coming off as “generic” may turn your prospect off to your product. Buyers love feeling cared about and even something as simple as including their name in an email or delivering them content that specifically fits their particular needs at that moment can make a world of difference. 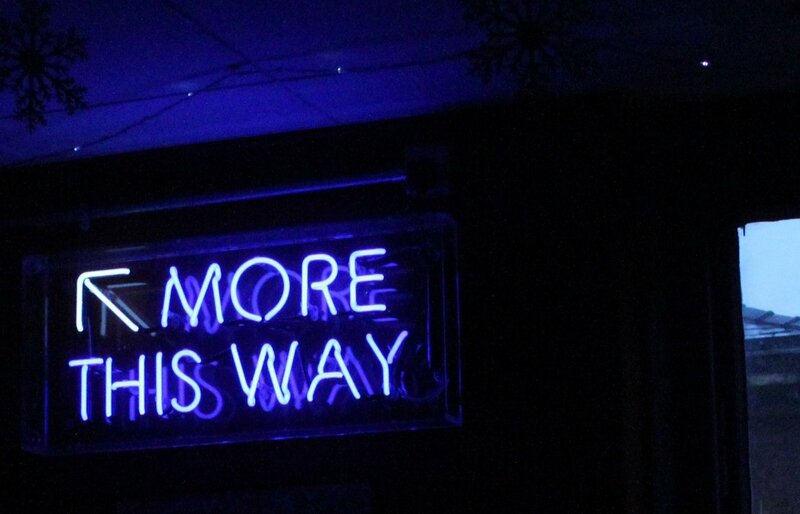 Once you have a comprehensive understanding of your target audience and their progression through the buyer’s journey, you can continue on to this step. To map B2B content to the buying cycle stages, consider how much and what kind of content, which topics, and what tone will be needed for each persona in each stage. 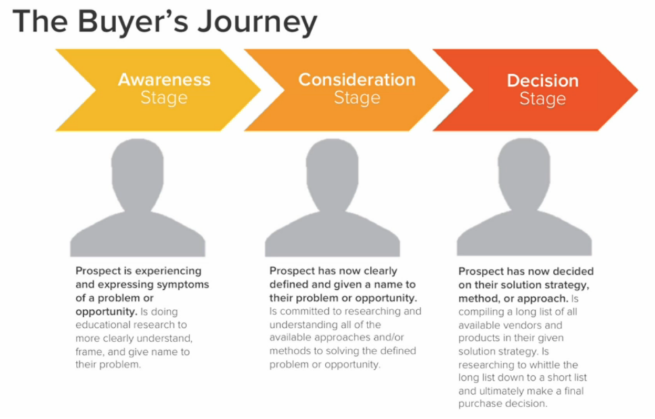 As you can see from the image above, each stage in the buyer’s journey has content types that are most suited to it. For prospects in the top of the funnel, or Awareness stage, you want to create content that focuses solely on the buyers’ pain points—not your brand or products. Therefore, educational content in the form of white papers, guides, ebooks or informative blog posts are the way to go. And of course, all content should be fully optimized for SEO purposes because the first place your prospect will go when they have a problem is Google or another search engine. In the middle of the funnel, or the Consideration stage, your leads will want to see content that speaks directly to the decision makers in the organization your targeting. This includes webinars, case studies, or product spec sheets—anything that makes the case for why your solution can be valuable to them. Finally, at the bottom of the funnel, or Decision stage, you can get as brand specific as you need with your content. Champion for why your product or brand is the best in the market and help make it as easy as possible for your leads to convert into paying customers. Content at this stage will include product demos, customer testimonials, and pricing information. The content types you mapped out in step 3 may seem overwhelming, but the truth is that much of the content may already exist on your blog and/or be easy to create when you repurpose other existing content. For example, if you have done a webinar in the past, you can make it available as an “on-demand” video as a new piece of content or you can share the slides from the presentation. If you have created a blog post that enjoyed good traction, you may be able to expand on it and create a white paper. There are many different types of content available to you and repurposing them can be a huge time saver. In order to find the best way to proceed in repurposing existing content, conducting a thorough content audit is essential. By analyzing the performance of your existing content you’ll get a clear picture of how each type of content is performing and understand what actions you’ll need to take in order to improve each page. Taking these steps to improve your content will lead to increased traffic and more leads from content you already have. Your B2B content should be truthful and straightforward. When creating technical documentation, do not oversimplify. When creating case studies, present situations as they were. With each piece of content, seek to share information that provides value to your target audience. The first steps described above should have led you to a thorough understanding of the users consuming each piece of content. As you curate the new pieces, make sure they are relevant to your target persona. Find ways to make content pieces engaging to the users. Add visual aids to make content more digestible and interesting. Do not sacrifice the opportunity to optimize each piece of content to align with your B2B SEO strategy and goals. Some of the best content is generated by users. You can curate pieces from user questions, testimonials, case studies, feedback, experience, and more. Where appropriate, add calls to action to your content. Do not fall into the trap of having only one kind of content on one platform (i.e., blog). Find ways to expand into new platforms. Create different types of content based on your target audience’s preferences. Once your content has been created and published, find ways to share it. Share on social media (not just Facebook and Twitter – be creative with industry-specific and niche networks too) and encourage your team and followers to do the same. Share your content in email newsletters and/or message groups. Find the sharing channels that your B2B target personas use and share it there. Each piece of content, as well as every other B2B content marketing initiative, should be tracked and monitored. Create KPIs to monitor your success and repeat effective campaigns. Google Analytics can track metrics like traffic, time on page, bounce rate and conversions to a page for content that you publish on your own sites. SEO tools like Majestic SEO can be helpful in tracking backlinks and social media mentions of content published on other sites. 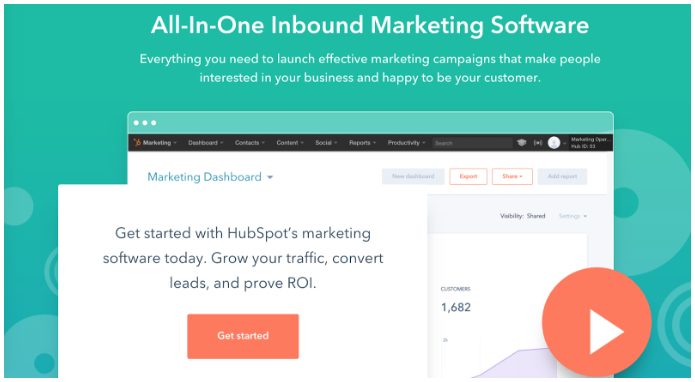 HubSpot is also a great marketing automation platform with analytics that can easily measure your content marketing results. Each of these steps is important to your content marketing strategy for B2B and should not be skipped. On the contrary, even once your strategic plans are in place, you should periodically go back and readdress/optimize the early steps of the process. Find out more about Content Marketing and let us know about how effective these steps have been for your business. Need help creating YOUR content marketing strategy? Contact KeyScouts for a free consultation or a content audit, and see what we can do for you.